Take a walk in Roundhay Park - Tour Map and guide. 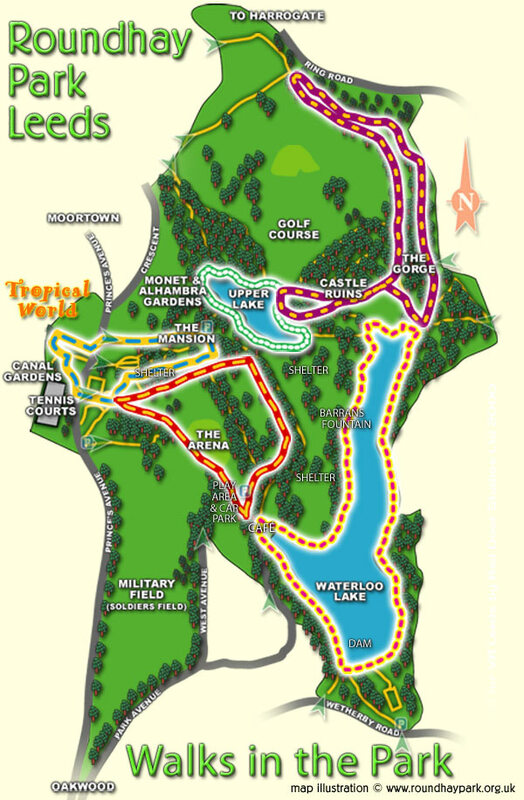 Map of Roundhay Park, Leeds, West Yorkshire. Roundhay Park is one of the largest Municipal Parks in Europe! You can explore the park by the many paths and trails, a selection of which are detailed on the map above. Choose from our featured walks. Did you know the UK Department of Health advises that Adults should aim to take AT LEAST 30 minutes moderate physical activity every week? What better way to enjoy your activity than talking a walk in our beautiful Park - open every day, whatever the Season. Roundhay Park in Leeds has been named as one of the region's leading green spaces in the Good Parks Guide. Free map of the park? If you would like a high resolution version map of Roundhay Park, Leeds West Yorkshire to print out FOR YOUR OWN PERSONAL USE? ** - please click here to download a pdf version of the Roundhay Park Map. Please note the PDF Park Map is a file of 1.2Mb so may take a while to download. This peaceful walk passes through an area of outstanding natural beauty. The walk has rough, good quality footpaths with sections of steep ground. This walk circumnavigates the Upper Lake with wooded areas, natural water space and a host of wildlife. The walking surface is rough in sections but mainly flat. This walk circumnavigates Waterloo Lake passing Parkland, Woods and the Dam. The main focus of the walk is the tranquil beauty of the Lake. Take a walk and stroll through the specialist gardens af the park, including the new 'Friends of Roundhay Park Garden' at the west end of Canal Gardens. Take a walk around the architectural past of the park as this walk passes many of the main features. See the Park Arena which has hosted many large events and concerts.